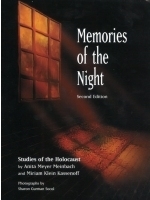 Memories of the Night: Studies of the Holocaust is designed for teachers, to help them bring the lessons of the Holocaust to life. First-person accounts and the literature of the Holocaust form the basis for challenging, thought-provoking reflections and a variety of interdisciplinary activities that encourage students to connect the lessons of the Holocaust to the principles that will govern their own lives. One of the authors, Miriam Klein Kassenoff is a Child Survivor and has included in this valuable curricula her own memoir of escape and hiding from Nazi Europe in the early years of the war as well as a touching memorable poem about that experience all teachers and students will want to read and share and learn about this sacred piece of history. “The systematic state sponsored murder of 6 million Jews in the Nazi Holcoaust of 1933-1945 is an enormously large event that darkens the landscape of 20th century humanity and continues to haunt us today .Auschwitz re-defined the moral landscape of our common humanity. Miriam Klein Kassenoff and Anita Meyer Meinbach have offered in this unique curricula the 3 major ways of transmitting this sacred history for our teachers and students in our time via the memoirs of the survivors, literature and film. They have chosen wisely and widely masterful films and classical works of literature and poetry and most important 1st person Holocaust Survivor Testimony. Indeed, Miriam being a child survivor herself, has included here for student use her own memoir of fleeing Nazi Europe and a moving poem of that experience.